Do you or someone you know love wine? I was born and raised within 15 minutes of the Napa Valley so of course I have a soft spot for wine and the wine industry. But, just because I grew up in the region, doesn’t mean I’m a wine connoisseur. When it comes to picking out wine, I need just as much help as the rest of you. I look at all the websites for reviews, but in reality (at least from what I’ve found) it’s all just jargon and industry speak. Here’s what I want: to find a bottle of wine, preferably inexpensive, that’s going to 1) taste good and 2) pair nicely with my meal. Like me, are you tired of endless websites giving you “professional” wine reviews that quite frankly are just too boring and don’t reach you on a personal level? How come we can’t just find a couple of everyday guys who aren’t going to tell me what they think I want to hear, but instead, the wine I should buy that won’t cost me a whole week’s paycheck? Well thankfully a website made just for you does exist. Let me introduce you to Joe and Matt of Thumbs Up Wine. Thumbs Up Wine provide tools including video reviews, a mobile app and more to help people find the best supermarket or warehouse wines. They make it simple for you, the everyday consumer. As their website says: “No one wants to know whether the wine has “notes of Cavaillon melon.” But everyone wants to know whether it will go with the steak/chicken/pasta that they’re having for dinner.” Does that sound like you? Well…it sounds like me, my friends and my family. Furthermore, the guys on Thumbs Up Wine go out and taste the wines that you can actually find, tell you what’s good/what’s not, and actually make sense of it all. The site completely independent – they are not paid by, or affiliated with, any winery. Their mission is simple: to pair consumers with the best bottle of wine that you can find at your local grocery store, based explicitly on what you’re looking for. As most you you already know, sometimes I don’t have the world’s greatest attention span. It’s because of this that I love their series of videos. On the site, you can find the good, the bad and the ugly. They’ve already got more than 100 videos but I hear that they’ve got another 10 – 15 entertaining ones that will be released over the next few months. Can’t wait! Did I mention they have a mobile app? Of course they do. Everyone does these days. But this one will really help you out when you’re looking for just the right bottle. Appropriately named “The WineFinder”, this app matches you with the best wines in the store you’re shopping in, based on the perimeters you’re looking for. Even better: it’s updated every week. So, if you’re looking for that perfect bottle of wine tonight and don’t want to go through the hassle of reviewing boring website after boring website, be sure to check out Thumbs Up Wine. Down-to-Earth reviews made specifically for you. Who doesn’t want that? Check them out on Facebook and follow them on Twitter at @ThumbsUpWine for more information. There may not be a finer diner on the West Coast than the Black Bear Diner. I found this chain of restaurants about 6 years ago while living in Beaverton, Oregon. We stopped in one time because we loved the fact that there were bears greeting us outside in the parking lot (statues, not real bears). 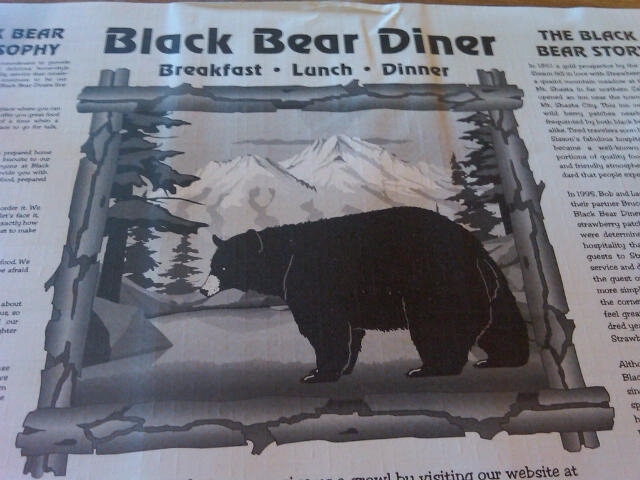 According to their Web site, in 1995, Bob and Laurie Manley, along with their partner Bruce Dean, opened the first Black Bear Diner on the site of the old strawberry patches near Mt. Shasta. They were determined to rekindle the level of hospitality that was lavished upon early guests to Strawberry Valley. The menu, service and decor were designed to remind the guest of a time when life was a little more simple, and service and quality were the cornerstones of business. On this evening, the service at the Rohnert Park restaurant was wonderful. No wait for a table and our server promptly brought out glasses of water for all. It didn’t take long to choose my meal for the evening off the menu, a hot turkey and mashed potato sandwich with all the trimmings. This is probably the ONLY meal I have ever eaten at this restaurant, but if you take a look at the photos, you’ll understand why. Eating this meal is like having Thanksgiving dinner everyday. 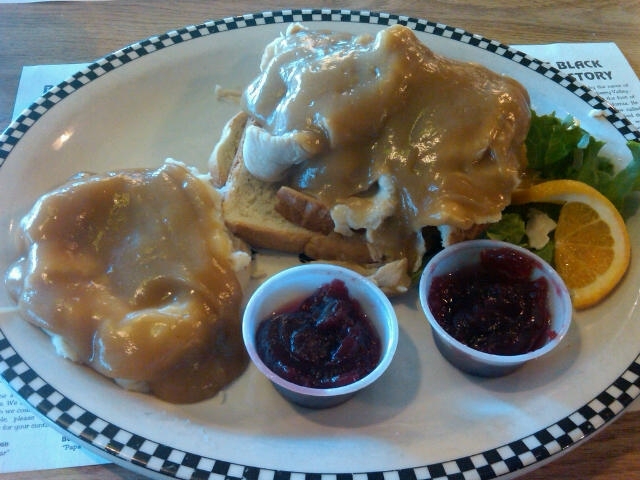 The sliced breast meat is piled high atop four slices of sourdough bread and then covered in a rich, turkey gravy. What tops off the meal is the homemade mashed potatoes that come with the meal. As you may have noticed in the photos, you don’t have to worry about getting enough to eat. The portions are enormous and you will most definitely have food leftover for the next day. Locations span the West Coast and as far east as Colorado and Iowa. Be sure to check them out and let me know what you think!